Mathieu Routhier, developer of Suggester, released ChordPadX. The app lets you play chords by simply tapping on a set of 16 finger pads. ChordPadX arrives with Audiobus and Ableton Link. The app is free to try, but costs $5 to unlock everything. I think it is free for 14 days and then you have to pay. 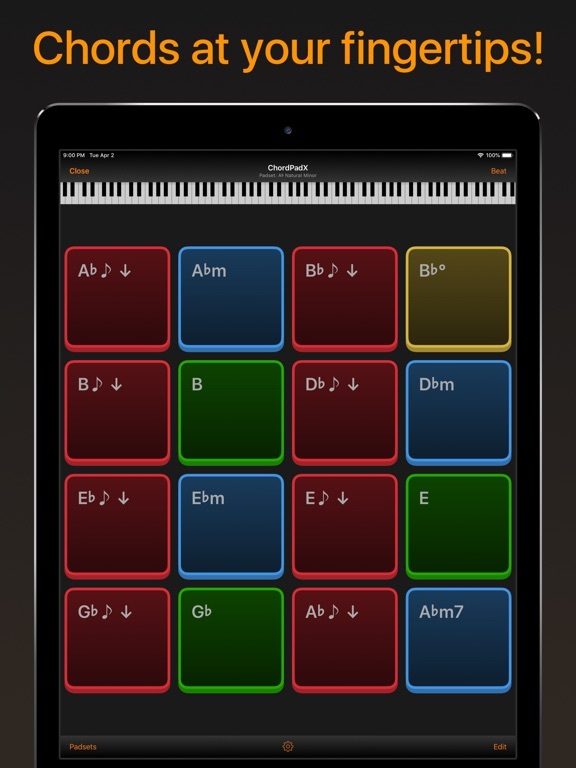 UPDATE: just downloaded this and it looks like you can play the chord pads forever without buying the IAP. But lots of other features (MIDI, other instruments etc) are still locked. If you want to try all the features unlocked, you can start the 14 day trial period. Or you can just buy the IAP and get everything. To get this to work in AudioBus you have to open the app first then open AudioBus and then load the app. I bought the full version and sadly it does not appear to be able to work as a MIDI controller for other synths or apps without including sounds from its own sound engine. It only has three instruments in the full version - piano, electric piano, and strings. This would be a great app if it could control other apps without mixing in its own sound, but that is not possible now which is a damn shame. I have 99% less use for this than I hoped. I hope they add the full MIDI out controller-only feature. Thank you for that report, claude! That seems like an obvious omission to you and me, but you should ask the developer so that he knows it is a wanted feature. I bought the full version and sadly it does not appear to be able to work as a MIDI controller for other synths or apps without including sounds from its own sound engine. .. can you open this in AUM and add another synth and get ChordPadX to run the other synth and use AUM's "mute" to kill the sound coming from ChordPadX?